A summertime Q&A touches on drinks alfresco and other “hot” issues. Must be tourist season because readers are pinging my inbox inquiring where to take their guests for a drink, where to do it alfresco and where to meet our living legend, Murray Stenson, behind the bar. Q: I’ve got a friend in Seattle for a few days, and he was wondering if Murray Stenson is still active somewhere. And any advice on shiny new bars appreciated. It’s a handsome bar with a marble top and a mahogany armrest. There’s a rich history of well-known bartenders who cut their teeth at Il Bistro long before the craft-cocktail renaissance. And it’s a quiet place, amid the bustle of Pike Place Market above it. Consider it a twofer: Take a gander around Pike Place Market and when your guest is done, take a flight of stairs down to Il Bistro to order The Last Word cocktail from Stenson and decompress. Other new cocktail dens worth a visit: Check Navy Strength in Belltown, the ambitious tiki bar without the Polynesian kitsch and L’Oursin, where barman Zac Overman makes some of the most original drinks around town. A: How about a half-dozen? To wow your guests, the view at The Nest in downtown is hard to beat, postcard-perfect on a cloudless day, with views of Puget Sound and the snowcapped Olympics, as dreamy a view of a Seattle summer as there is. Or head to Mbar, 14 stories up in the South Lake Union tower. But both lack that homey vibe. 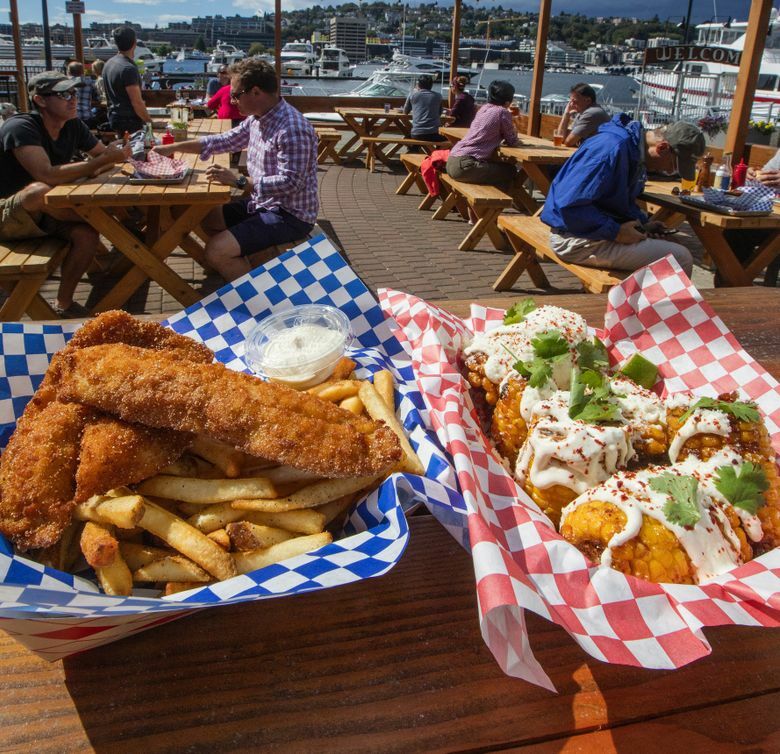 Get your Facebook selfie at one of those rooftops, but settle in at Marination Ma Kai in West Seattle, a beach setting without the spring-break scrum. It’s also the best choice if your guests have children in tow. Ma Kai’s patio is not a bar, so minors are allowed. Make a day of it. The bike-and-kayak rental shop is behind Ma Kai, and the water-taxi dock is out front. Or spend a lazy afternoon at Westward, slouching on the Adirondack chairs with a rosé bottle on ice while facing North Lake Union. If you go on a weekend, get there between lunch and dinner time before the madness. The 100 Pound Clam in South Lake Union is one of the newer patios if you have one of those seen-it-done-that-repeat guests. Ray’s Boathouse in Ballard is a classic.